One of the most beautiful words in Sacred Scripture is used to describe God’s original plan for the human race, the dream He had for us in the beginning. It reveals what the world was like in the Garden of Eden, before the fall, in the Book of Genesis. That same word is also found in the final book of the Bible, the Book of Revelation, to describe the heavenly reward of those who persevere in their faith to the end (see Revelation 2:7). The king would have his own walled-in garden, his own paradise, filled with beautiful flowers and fruit trees. Only those closest to the king were allowed to walk with him in that sacred space. The queen, perhaps members of the court, and those most intimate and familiar to the king would spend time with him in that paradise. They would converse with him in the beauty of that garden. 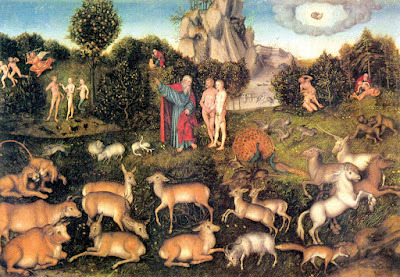 The Book of Genesis begins with Adam and Eve, spending time with God in paradise. He lovingly comes to them, “walking in the garden in the cool of the day” (Genesis 3:8). God created them—and us—to share in this intimate paradise with Him. Our first parents disobeyed God and broke that beautiful discourse between God and humanity. They were exiled, east of Eden, and paradise was lost. Very soon after that tragic forfeiture, however, God immediately begins to forge a way back for His people. God takes the initiative to renew the conversation that He created us for. In the Old Testament, it happens in two fundamental ways. First God makes a covenant with His people. He gives them the 10 commandments, the Law, and He commits Himself to a relationship of love with them. Reminiscent of paradise, in the beginning, God declares to them, “I will walk among you, and will be your God, and you shall be my people” (Leviticus 26:12). But Israel did not always walk with God; they were not always obedient to the law. Therefore, God again took the initiative to keep the conversation and the hope alive. He sent them prophets. The prophets speak for God, carrying His message to His beloved. The prophets call God’s people back to the covenant that they made with Him. Over and over again, God reaches out to them, drawing them back to that relationship that defines them as a nation. Ultimately, though, it is Jesus Christ who speaks to them and brings God’s message of eternal peace. Jesus comes to throw open the gates of paradise for all humanity. He offers Himself up on the altar of the cross to give us freedom from sin and death. It is there, at that place of great suffering, that He encounters fallen humanity in the Good Thief. That condemned man pleads with Him, “Jesus, remember me when you come into your kingly power.” The King of Kings replies, “Today you will be with me in paradise” (Luke23:43). Today you will walk with me in that sacred, walled-in garden. Today we will continue this conversation for all eternity. In the cross and the self-offering of Christ “paradise lost” becomes “paradise found.” It is the moment of greatest significance for our salvation and the forgiveness we long for. Through His passion, His suffering and death, Jesus heals our broken world and brings new life. But the cross is a difficult reality. Christ had just been speaking about the cross in St. Mark’s Gospel when he was met with opposition from His own disciples. He had shared with them, quite openly, “that the Son of man must suffer many things, and be rejected by the elders and the chief priests and the scribes, and be killed, and after three days rise again” (Mark 8:31). That is a difficult message to accept. We would have it otherwise. We would rather that God remove the crosses we carry and eliminate the obstacles that stand in our way. Struggling through the daily challenges and painful contradictions of life is hard. We often grow weary and discouraged by the reality of the cross. The cross is hard, and Jesus knows that. For that very reason, immediately after announcing the truth about redemption through suffering, He takes Peter, James and John and leads them up to a high mountain where He is transfigured before them. They saw Him in the glory He possessed with the Father before the foundation of the world, the glory that would be revealed to all after His resurrection from the dead. Those disciples witnessed Moses and Elijah, the law and the prophets, speaking with Jesus and affirming His path from the passion to the glory of risen life. Jesus was communicating to them, and to us, that this thing ends really, really well! Yes, there is toil and strife here, but it leads to eternal peace. We will have to strive and struggle every day in this life, but in the end we will enter into eternal life. This life will contain trials and the cross, but the next one will be nothing less than a share in the glory of the risen Christ! Listen to Him, Peter, as He leads you through this world in service and toil. Listen to Him, as he gives you all you need in the sacrifice and the struggle that will sanctify you and make your life a gift for others. Listen to Him as He leads you through this world of difficulty and danger and into the glory of the resurrection. This is the great message for us on this Second Sunday of Lent. We are called, along with those chosen disciples, to listen to the voice of Jesus Christ. Jesus speaks to us today from this sacred altar, “This is my body . . . this is the chalice of my blood . . .” Take and receive my very life and know that I am with you in the daily struggles that you face. I am here with you, now, and will give you the strength to bear all things. I live in you. We listen to Jesus Christ, who speaks to us each and every day when we spend time alone and silent before Him in prayer. When we take the time to sit before the Master in Eucharistic adoration, or to meditate on the mysteries of His life in the Holy Rosary; when we kneel in the solitude of our own rooms or wherever God is calling us to be alone with Him, we listen to Christ. In particular, though, we listen to Jesus in the daily challenges we face, knowing that He has not abandoned us, that He never leaves us, and that He is able to give us all that we need to follow Him faithfully and joyfully in this life. We listen to Jesus Christ, who reminds us in a thousand different ways, that that the difficult and sometimes painful path of Christian life leads to the joy of eternal peace. The road of the passion—for Jesus Christ and for us—leads to the glory of the resurrection. May we be found walking on that path this Lent, and may be walk with Him forever in paradise in the life of the world to come.